With majestic trees and gardens surrounding its buildings, Zojo-Ji temple is one of the typical symbols of Jodo-Shu Buddhism in modern Tokyo. The red and white colours of the walls, surrounded by tall trees and Tokyo skyscrapers form a peaceful atmosphere, away from pollution and noise of the city. June 2015, panorama from 3 vertical images, additional exposures for highlights, focal length 16mm, aperture f/11, shutter speed 3.2 seconds, ISO 100, tripod, pano head. From each corner of the temple grounds, the Tokyo Tower is visible to the eyes of the visitor. The main temple buildings were rebuilt, after a bomb raid during WWII, and it is nowadays more of a popular walk in nature and meditation shrine for the Tokyoites, than a residence quarter for the 3000 priests who once lived here. There are many temples and parks around the capital, such as in the Asakusa area, but this one stroke me on the way back from my Tokyo Tower shoot on the previous day. It is all about the juxtaposition of the “old” and “new”, the quietness of the temple and the noise of the city, the green of the garden and the grey of the stone jungles, the ancient look of the wooden temple and modern look of the steel tower. This is a perfect metaphor for the unique Japanese way – balance between the modern post-industrial lifestyle and old traditional ways. In recent times, the Japanese culture has become a strong mix of traditions and modernity. And this reflects in small details of everyday life. The antique stone pavement leading to Zojo-Ji temple is a passage to the enlightenment of Buddhism, within the modernity of the city. Woking up early, I walked to the temple through the Shiba park, and as I approached my scene location, the clouds gave me hope for a dramatic colourful sunrise on the temple grounds. On the way I noticed that the top part of Tokyo Tower was not illuminated. It looked ugly and created a real threat to my envisioned composition. 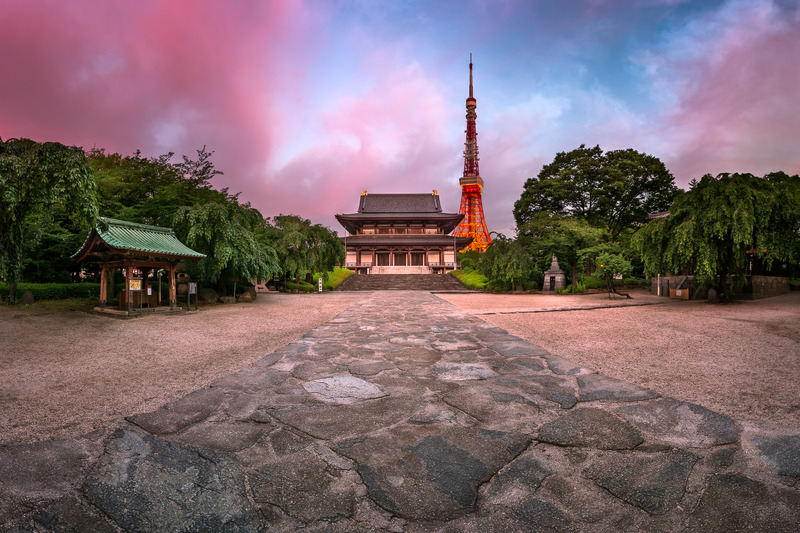 Though I decided to proceed and worked on the composition in order to find the best panoramic view including the Zojo-Ji temple, Tokyo Tower and the path to enlightenment. As the sunrise began, I breathed a sigh of relief. With the glowing red sky in background, the fading Tokyo Tower illumination started to look perfectly in balance with the whole scene. And this also added kind of mysterious mood to the shot and worked well for supporting the main idea of this photo. Finally I’ve got the shot I was aimed for and I was very happy that unexpected obstacle suddenly turned out to support my goal. This entry was posted in City and tagged Japan, Tokyo.